Let’s face it, everyone in this day and age texts. If you’re not sending or receiving text messages on a daily basis, you’re missing out on one of the quickest, simplest and most effective methods of modern communication. Text messages, and also SMS, allow users to quickly send a brief, or sometimes lengthy, message to one or more parties. Texting is so popular, it’s even popping up as one of the next methods to contact business support. Before we know it, texting will replace a majority of our communication, as I’m sure it has already for most in their personal lives – sending a text instead of picking up the phone to place a call. Some business VoIP providers are even designing their new IP Desk phones with built in smartphone integration. The entire idea of workplace texting has grown out of the idea of utilizing text based communication to quickly and effectively get in touch with a coworker – so why not utilize texting when possible as well? We may not all have a work based mobile phone, or want to mix in our business and personal communications, but most VoIP providers offer text and SMS based messages as standard in their hosted unified communications solutions. You might have the ability to text from your desktop, or even mobile phone app and may not even realize it yet. Just try not to be “that guy” and follow some basic business texting commandments. Why Would Your Business Need to Text? It’s as simple as that. Up to 97% percent of Americans utilize text messages and whether or not that is their primary method of contact, it’s still safe to say just about everyone texts. When trying to get hold of a coworker quickly, or reach out to a client or customer texting is a surefire way to get in touch as soon as possible. So it only makes sense to adopt this platform into the workplace, because sometimes a phone call or voicemail isn’t quick enough. Texting will offer that simple and effective way to get in touch fast. Texting is also often the preferred method of contact for clients and customers, while some may appreciate the personal touch of a phone call, others may prefer to keep things fast and easy and allowing texting is the perfect way to enable just that. As mentioned before, the reason texting has become so popular is the level accessibility and ease involved. Sending a quick text message to your boss, coworker, intern, or client will take far less effort than the sometimes lengthy process of an entire email, and the limited nature of texts allows users to keep it short, sweet and to the point. Not to mention, an email or voicemail is incredibly easy to disregard and ignore. A text can be as well, but many of us recognize the abrupt nature of a text, and the urgency required when texting is used as the method of contact – if it could wait they might have just sent an email. Not to mention, the simplicity of texting just makes it easier to respond, as opposed to hunting down the proper CC in an email chain, writing out a formal reply and attaching any necessary documents. Each process has its own use case. 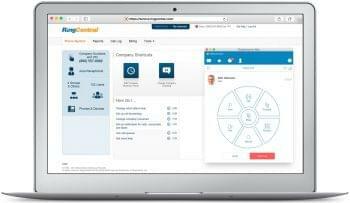 With apps from some of the most popular VoIP and Hosted PBX providers, business texting can be done from the same app already utilized on either your desktop or mobile phone. Not many of us might want to mix together personal and business conversations, as things can get tricky pretty quickly, but if your office is already utilizing a VoIP or Hosted PBX provider that offers (and most do) a desktop and mobile phone app, texting is normally just one extra featured tacked on. These apps should also include all of your text messages in a persist history, and can function as a replacement or substitute for a standalone chat or team collaboration software app. Since most of the popular Hosted PBX providers aim to make their solutions as simple as possible, texting from your VoIP phone number should be a relatively quick and easy process to adopt. 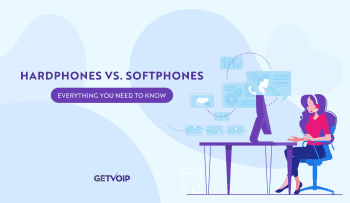 With softphone desktop apps, and even mobile phone apps on both iOS and Android, from the same display that you can use to make or receive phone calls, or check a call history or contact list there will generally be a texting function as well. Utilizing these same apps keeps everything familiar and simple. Some of these apps can even provide group messaging to quickly get in touch with an entire team, or bring in any other participants to a conversation – for example if a client sends a text requesting help on a specific product or project, simply add in the appropriate agent to your text conversation. 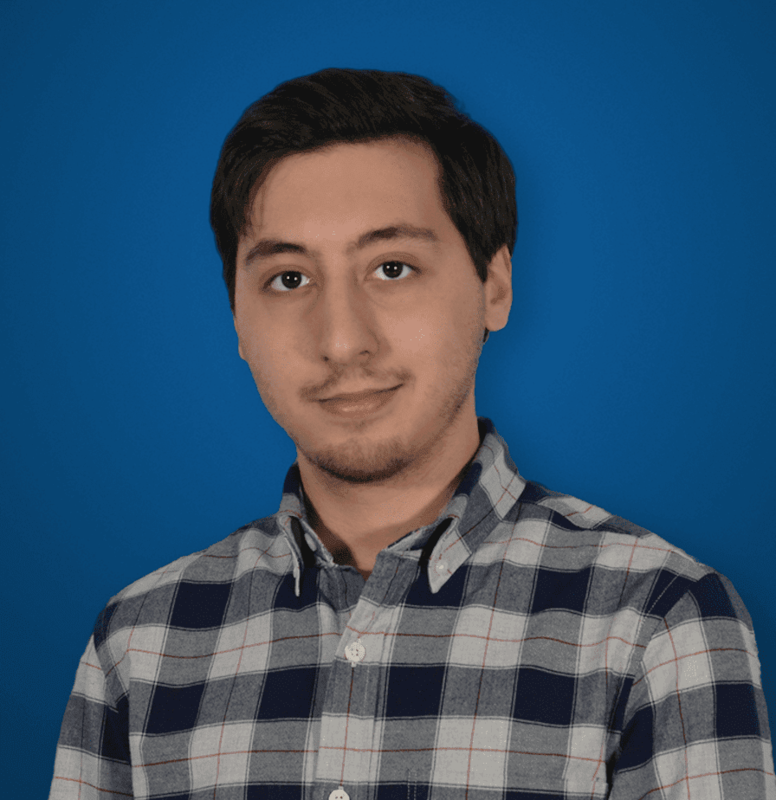 As many have come to realize when adopting both an Apple computer and iPhone, utilizing a texting app on your desktop is incredibly beneficial when attempting to respond and react rapidly to incoming texts. Because VoIP providers aim to make their desktop and phone apps as similar as possible, texting from your desktop computer is a breeze and the ability to use a full-sized keyboard, instead of a tiny touch screen, will be a massive improvement to your texting capabilities – whether attempting to get in touch with coworkers out of the office, or handle a large volume of incoming client or customer text messages. 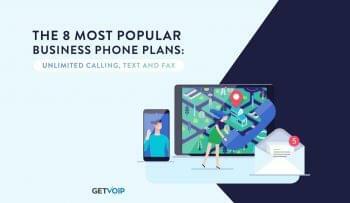 Because your text messages will be traveling through the same network and service as your phone calls, using any of the popular VoIP providers will ensure your text and SMS messages will also be sent through a secure, robust network. Security is of a high concern to many businesses, and for good reason, but can often go unchecked. Texts sent through a major phone carrier aren’t incredibly vulnerable, but with the ability to keep security in house or adopt a provider with a high concern for security can be a vital step for any business to protect their network, and communications. 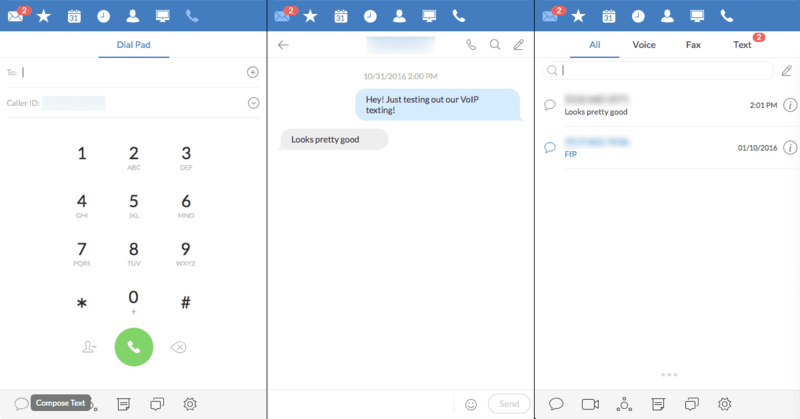 Integrated email notifications with your VoIP based text or SMS messages adds a level of redundancy, as well as a complete and secure history of messages. This will help ensure you receive each and every text message, and would be especially helpful for those businesses looking to utilize this method of texting as another contact portal for their clients, customers or potential prospects. Instead of typing away on your phone, or missing that on text, you can utilize email to keep everything organized, secure and stay on top of every incoming message. Generally included in most Hosted PBX service plans, SMS and texting can be done from the same applications already utilized, and should come at no extra cost. Unlimited plans generally also allow for unlimited SMS and text messages to be sent and received from your VoIP lines. While each case may differ based on the specific provider or solution your business adopts, or the plan to which your business subscribes, SMS and texting is more often a simpler addition included in the already extensive list of available features. You should not be required to adopt any further solutions or feature add-ons, and a cloud based provider means no extra hardware. Even if your workers do not have their own specific work mobile phones, they can utilize their computer or personal mobile phones. Texting, whether it be with co-workers or clients, can be one of the easiest ways to elevate the level of communications in your business. Customers and clients will love the flexibility your business and support can provide with the addition of texting capabilities, and this is rapidly becoming a more common trend. Your coworkers may not love it as much, but with an easier way to get in touch and keep everyone in the loop, texting can certainly remove some of the headaches of missed communications, and the annoyance that can accompany emails. There certainly is a reason workplace chat apps like Slack, and many team messaging alternatives, have taken off. While texting might not be exactly the same, it still offers one of the quickest and easiest ways to grab someone’s attention, and receive that quick last minute answer you needed to top off your project. With most VoIP providers already including texting capabilities baked right into your solutions and applications, it should be almost no-brainer to expand your business communications to texting. Good article! We chose to only use VOIP currently for our communication needs. It works pretty well, and we don’t have to deal with scammers wasting our time. Is there a Google Voice that’s free?